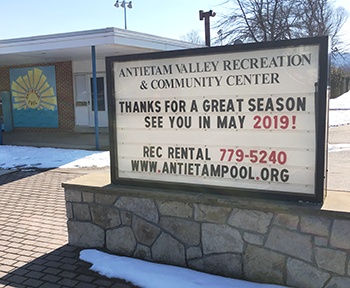 We welcome you to join Antietam Pool! Any season pass holder who lives in Mt. Penn Borough, Lower Alsace Township, Exeter Township or St. Lawrence Borough, may vote at the general membership meeting in October or serve on the AVRCC board of directors. Opening day for the 2019 season is Saturday, May 25. Each member must present their current AVRCC photo ID for entrance to the pool. Access to the pool can be denied without proper membership identification. Hours for the main pool are 12:00 noon – 7:45 p.m., weather permitting. Beginning June 8, the pool will open at 10 a.m. on Saturdays. Hours for the Olympic Pool will be posted. >> View the detailed AVRCC calendar here. All members age 4 and over will receive photo ID’s as part of their membership fee. Non-swimmers age 4 and over will be provided with a wristband each time they enter the pool gate that denotes they may only swim in the shallow water of the main pool. Non-swimmers receiving a wristband MUST keep the wristband on at all times while in the pool area that day. Both group and private swim lessons will be offered throughout the summer. All swim instructors are trained in water safety instruction. Check the office for dates and times. In case of inclement weather, call the office at 610-779-5240. Payment must be made at the time of registration. Members and prospective members are invited to attend the general membership meeting, Monday, October 14, 2019 at 7 p.m. in the AVRCC rec center. The meeting agenda includes annual reports, election of directors and your suggestions. Our 2019 online membership application is NOW AVAILABLE. >> Click here to apply. Assessments have been suspended for the 2019 season.